Fun With Puzzles Brain Teasers Optical Illusions Puzzle Tutorials Stereograms How to see a hidden picture in Stereogram? 1. In the first method start from keeping the image very near to your eyes with your nose touching the surfaces. Try to concentrate on the centre of the image and slowly move the surface away from your nose. After you move this image at a certain distance, you will be able to see the 3D Stereogram image. 2. In the second method put the semitransparent sheet on the surface. You will see your reflection in this sheet as well as given 2D image. Do concentrate on your reflection. It is equivalent to looking beyond the surface. After some time your reflection will disappear and you will see this 3D image. For some people, it takes time to see the image the first time. However, be patient and keep trying. 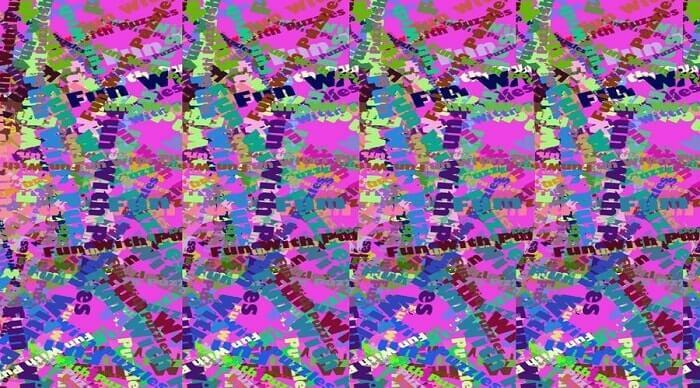 If once you are able to see this image, then it becomes very easy to see this image again. I mean all these efforts are to see the 3D hidden image only once. After you are successfully looking once, then your eyes and brain will immediately focus to see the image when you look at it next time. Here I am posting one Stereogram picture below. If you have never seen any Stereogram picture earlier then its challenge for you to find the hidden picture in this image? 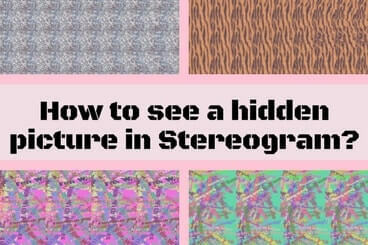 Can you see the hidden Stereogram 3D picture? One may find many Stereogram pictures on the internet. However, here is a list of Stereogram pictures published on this website.